I am entirely under the Chanel spell. Everything about this brand resonates with me - the history and heritage, the brand's visionary founder, and her enduring legacy. I desperately covet the classic quilted handbag, the two tone ballet flats and the iconic jacket and, while they continue to elude me, few things thrill me as much as a new beauty product featuring those interlocking C's. Here are my most recent acquisitions - bought in airports, all three, over the past month. Part of this year's summer collection, Delight is one of three new shades of Le Vernis - the others being Holiday (which I showed you here) and Island (a pale golden beige). Delight is a stunning golden bronze, with flecks of copper and champagne shimmer. It's dazzlingly beautiful in the sunlight, is opaque in two coats and lasts around a week on my nails (which, for me, is superb). It's €21.90 normally, but a few quid cheaper in duty free. I was thrilled to come across Vision just a few days after I wrote about it here - it doesn't launch in Ireland until next month. Texture wise it's a little different to the other Illusion D'Ombre shadow pots I've tried - it's closer to a gel, and while I was expecting an opaque gold cream, this is more like a clear gel base packed with fine gold glitter particles. I need to play around with this a bit more but I think it will work best layered under or over other eye products. Vision might not be one for everyday, but Epatant certainly is. This little pot of silvery grey green loveliness is incredibly versatile and can be worn sheered out or packed on for a sparkling metallic effect. It catches the light beautifully and would look great on pretty much all colourings and ethnicities. Want to see it in action? That's me looking shocked at just how good these are! Illusion D'Ombre shadows are €29 but again, cost less when picked up in the airport. What about you - have you splurged lately? Oooh I must get the gold eyeshadow to go with my Delight (don't you find it's quite difficult to remove)? Their nail polishes are always a favourite. I love this shade! I want these so bad. 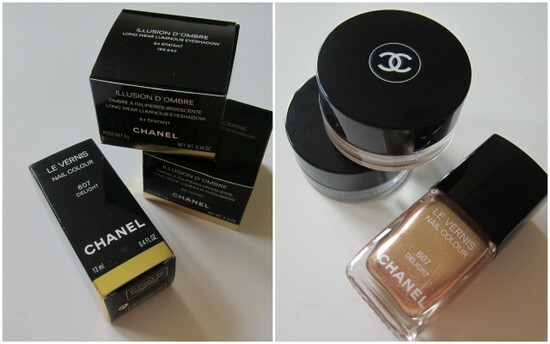 That packaging and the sparkles...you had me at Chanel. 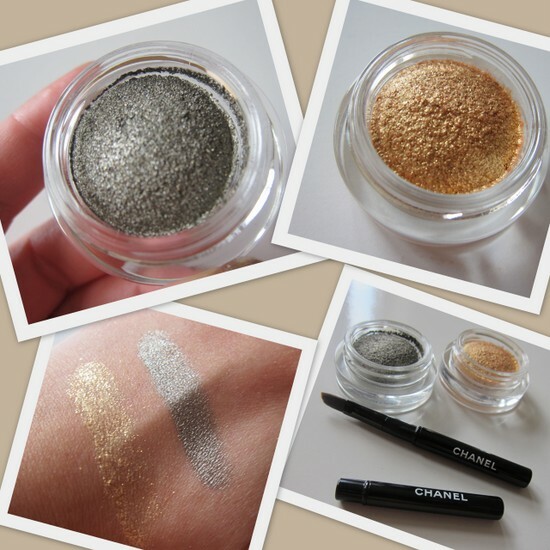 I think many of us are under Chanel's spell :) These shades are so gorgeous and wearable. 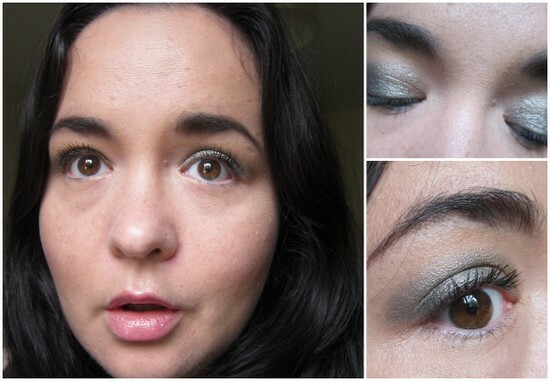 Oh, I love those metallic shades! I don't really splurge on eyeshadow and nail polish! I am not sure why either, but I am ok with the drugstore purchases. However, primers and foundation I won't settle! Love the gold polish! Hey girl! I'm definitely under the Chanel spell too. I use to cringe at the cost, but when I tried them and Dior you can definitely see the quality. I love these shimmery shades. Delight is such a beautiful color. Love the eyeshadows. 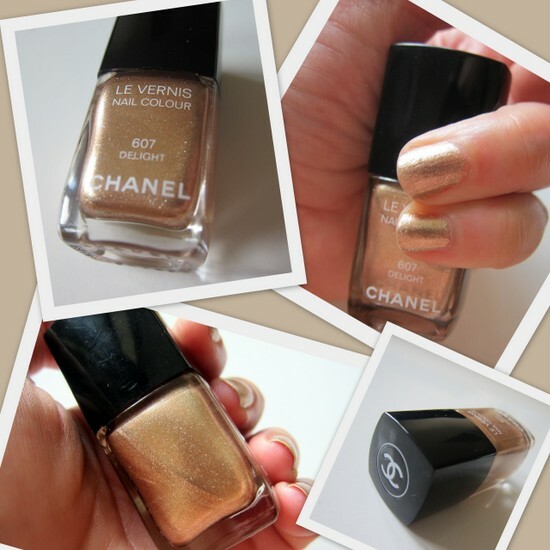 I've always wanted nail polish from Chanel... sigh :) I love the colors you chose! Oh my is Vision new? 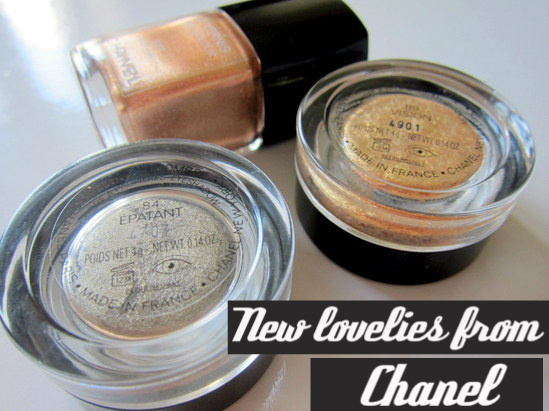 I do love the Chanel eyeshadows...have four already. That looks sooo nice. The nail polish shade is great on you!